Imagine being told that microscopes falsely "advance the idea" that bacteria and viruses cause disease. Or what if someone told you that telescopes falsely "advance the idea" that galaxies exist? You'd think that person was a few fries short of a happy meal, right? Well that's exactly the sort of argument Moira Weigel made at The Atlantic last month in an article originally entitled--I'm not kidding: "How Ultrasound Advanced the Idea that a Fetus is a Person." I say "originally," because the title has since been changed to the much less provocative, "How Ultrasound Became Political." Either way, Weigel's point in this bizarre rant against medical technology is to convince readers that ultrasound imaging does not, in fact, reveal babies in the womb. Rather, it's a tool pro-lifers have used to dupe women into seeing fetuses as human beings. She begins by recounting ultrasound's origin as a weapon in submarine warfare--a weapon that men soon turned from the ocean's briny depths "toward women's bodies." "Ultrasound," Weigel opines, "made it possible for the male doctor to evaluate the fetus without female interference," (as if women never become doctors). "The framing of the ultrasound,"--again, this is a quote--"was notable for what it excluded: the woman. In order to make the fetus visible, it made her disappear." I'm not making this up. Weigel argues that the form on an ultrasound screen isn't meaningfully different from the "rapidly dividing cell mass" of early pregnancy. "The current debate," she writes, "shows how effectively politicians have used visual technology to redefine what counts as 'life.'" 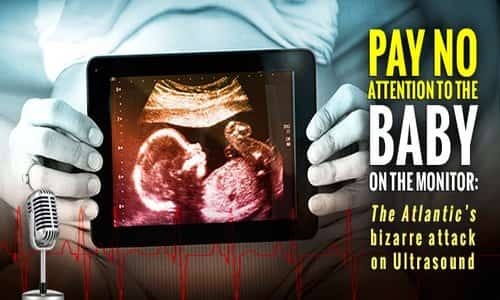 Even social media, it seems, is part of this conspiracy to humanize the unborn. Expectant parents who post black-and-white or 3D images of their babies on Facebook and Instagram are willing accomplices in this propaganda, suggests Weigel, who makes no effort to mask her disdain for this "popular enthusiasm for fetal images." This article was, to put it bluntly, an editor's nightmare. In the days following its publication, it's undergone major revisions, introducing a towering list of corrections about when a baby's heart starts beating, when it has reflexes, major mistakes about the stories of those featured in the article, etc. As of this recording, the editor's note was over 170 words long. Now look, I'm not going to pretend we here at BreakPoint have never made mistakes. We have! And we correct them whenever they're identified. But the sheer volume of error in this deeply weird attack on medical technology leads me to believe it was written to obscure the truth, not reveal it. Weigel is right that ultrasound has been instrumental in the pro-life movement. Pregnancy care centers report that nearly eighty percent of abortion-minded women choose life after seeing their babies on screen. A 2014 study of Los Angeles Planned Parenthood clinics found that a statistically significant number of women who had already made abortion appointments changed their minds after seeing their babies. And organizations like Save the Storks report that four out of five women who accept their free ultrasound service choose life. Ultrasound is instrumental in the fight against abortion precisely because it allows women to make an informed choice by shedding light in a place which, for most of its history, has been shrouded in secrecy. And when the pro-choice camp rails so angrily against the light technology has shed, it almost seems like they prefer the darkness. Perhaps what they see on that monitor troubles them. And you know what? It should.